Regular readers of LFR undoubtedly have noticed that I haven’t posted in a while. That’s because I’ve been diagnosed with an arthritic hip, which will be getting replaced in the next couple months. The hip gets so painful that I can’t sit in my computer chair very long. Obama built the energy industry? Who would’ve guessed that President Obama is responsible for the recent US energy boom? I didn’t know that but it must be true since he’s declaring himself the champion of building the industry. Let’s be emphatic about this. It’s impossible to advocate for “the need to end America’s century-long addiction to fossil fuels” while also insisting that you’re the man who pioneered the current energy boom. The 2 statements don’t fit together. When President Obama’s economic policies failed, he blamed the economy on President Bush. When President Trump implemented the policies that turned around the stagnant economy he inherited from President Obama, President Obama insists that he created the oil boom. PARTING QUESTION: If President Obama created the energy boom, why did millions of rural energy voters turn against the Democrats and vote for President Trump? BONUS QUESTION: If President Obama is so proud of his role in turning the US into a net exporter of fossil fuels, why didn’t he approve the Keystone XL Pipeline? Frankly, it’s disgusting that President Obama is this dishonest. Shakespeare told us that a rose remains a rose even if the name is changed. In the 2010 presidential election, we learned that putting lipstick on a pig is not enough to change its identity. I am confused, disappointed and even disturbed by media today that seem to paint bullying as a new phenomenon that occurs in schools due to guns. And that the persons that have shot school-age children suffer from mental issues caused by bullying. And bullying is as old as time. Bullying, by whatever name, is not related to gun ownership. It is spawned by sin and has been exacerbated by an increasing immoral society. I am confident that the majority reading this article have been picked on, insulted and bullied as a child AND as an adult. It occurs at home, at school, in the workplace—wherever the bully is. Just because it has happened to so many does NOT make it right. Nor did it begin in the 1990’s when researchers in this country became interested in the topic due to the school shootings. Bullying is about control by one or more over others perceived to be weaker, less desirable and not just for race, religion, poverty, physical characteristics or more recently, announced sexual preferences. It’s about power and control—to feed the bully’s ego and warped self-worth. Victims of the undeserved bullying have always suffered from lowered self-esteem, poor academic and/or work performance, illness, disturbed sleep, isolation and loneliness, etc. They have been targeted by ones with whom they should have had a positive relationship—family, friends and classmates, teachers and administrators, co-workers and supervisors. Instead they were attacked, often without warning. It just happened; it hurt; it was wrong. Studies say that observers should intervene. Probably, but why would they if they could become the next targets? The studies suggest that the young people should tell teachers. Probably, but it does no good if the bullies come from the families of social status in the community, from friends of the teachers, from the athletic teams of the school. They belong! The victims learn again that they do not count, and the pain is intensified. Many speculate on the causes of bullying—guns, violent movies, video games, drugs, race, religion, etc. Let me add to the discussion. In the 1960’s, God was removed from schools and society. Now progressives want Him removed from our history and governing documents. With the Hippies, drugs became more accessible and accepted. Now society is legalizing them. Currently the abuse of prescription drugs is epidemic. At the same time, family life was devalued and destroyed; co-habitation and no marriage covenant, no-fault divorce and no stigma, fatherless families and lack of role models. Some even advocate turning infants over to the State to be reared since families are incapable of providing for them. Bullying causes physical and emotional consequences that destroy human dignity, freedom and security. Previously, a stronger family re-affirmed the victims’ identity, even if the victim chose not to share the humility with the family unit but did find strength at home. Now that resource is not available to many. Cyberbullying is another layer of bullying. I thank Melanie Trump’s efforts to tackle this problem as her project as First Lady. I congratulate all who have had the family support to survive and thrive. Bullies want to hurt, harm and humiliate to feed their egos. They won’t stop. But we can help the targeted victims. Our task is to love our family members and let them know that they are valued and loved. Hug your child; take time for your child—no matter their age. I can’t wait for 2016 to end. Please understand that parts of 2016 were exceptionally enjoyable. Think Trump defeating Hillary, Republicans flipping the Minnesota Senate and, most importantly, the Cubs defeating the Cleveland Indians (Sorry Hugh.) in winning their first World Series championship since 1908. What hasn’t been that enjoyable has been my health. At 2:30 am on Aug. 1, I woke up with chest pain. A friend gave me a ride to the hospital, where I checked into the ER. After running a couple tests, I was admitted into the hospital. I was told by the cardiologist that treated me that I’d dodged a major bullet. The cardiologist said that I had a 90% blockage of the left anterior descending artery. The path chosen was to place a new stent in the LAD through angioplasty. In the 9 days that I was in the hospital, I lost 23 lbs. On Friday, Sept. 30, I was rushed by ambulance to the ER with an acute shortness of breath. I was able to tell theme that I wasn’t feeling any chest pains. After running an EKG, they were able to confirm that I wasn’t suffering a heart attack. After running another test, I was diagnosed with multiple blood clots in my right lung and multiple blood clots in my left lung. The good news is that I’m recovering nicely. I’ll probably have to take warfarin the rest of my life but that’s ok. I wish that would’ve ended my health issues but it didn’t. This past Saturday, Christmas Eve morning, at 8:05 am, I slipped on a patch of glare ice on the top of my back porch. I landed on the sidewalk 3 rungs lower, a drop (for my back) of 60″. It doesn’t take a rocket scientist to understand that I was instantly in pain. I’m finally out of the hospital but now there are things I need going forward. First, I need a railing for my steps to give me something solid to stabilize myself when navigating my steps (both going up and down.) After Saturday’s fall, I realize I need a rain gutter to keep melting snow from the roof from icing up my steps. I don’t need a full gutter system, just something to keep the melting snow off my steps. There are some things I need inside the house, too, starting with an ergonomic chair for my computer. A few weeks ago, I posted a bleg on a political subject. Today, I’m posting an ’emergency bleg’ to help defray the costs of the changes I’ll need to make going forward. No contribution is too small. All contributions are sincerely appreciated. If you want to contribute to these causes via credit card, hit the donate button in the top corner of the right sidebar. If you don’t trust that method, just leave a comment to this post. I’ll send you an email explaining how to contribute through more conventional methods. Here’s hoping you had a Merry Christmas. Here’s wish you a Happy New Year. PS- Despite being in the hospital for Christmas, God still figured out a way to bless me. Color me grateful and humbled for that. Potentially more significant, however, are those voters who “flip”— Sracic’s second category. “Remember,” he said, “taking a Democratic voter and having them vote Republican is both a +1 and a -1. In other words, if Romney lost Pennsylvania by 300,000 voters, all you have to do [this time] is flip slightly more than 150,000 votes.” Between Ohio and Pennsylvania, if approximately 225,000 voters (out of the 11 million who are expected on Election Day) switch parties, they could tip the entire election. 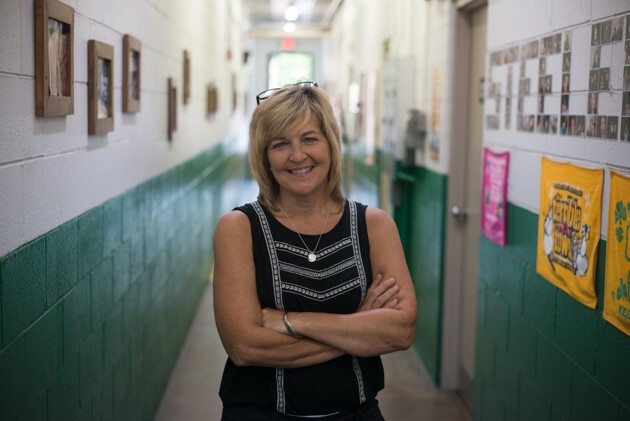 “Nine years ago I was forced into retirement at Corning, and I needed a job with health care,” said Paul Satranko, a lifelong Mon Valley resident. A Vietnam War veteran, he played Little League baseball 60 years ago with Lee Supply’s CEO, he has been the company’s janitor and all-around character ever since. “There is no room for apathy in this election,” he said. “I think that is what people not from around here don’t understand—we are voting for our lives.” He plans to vote for Trump. About 45 minutes ago, the sirens went off. A minute later, the local weather station announced a tornado warning for “Benton and Stearns counties.” At the time, the tornado warning was set to expire at 6:45 pm. At that time, the tornado that had touched down was moving northeast at 35 mph. The tornado warning has been extended until 7:15 pm. Further, weather spotters reported that a tornado had touched down in Sartell, about 5-6 miles to the north of me. UPDATE: A friend just called me. My friend said that a funnel cloud had passed to the north of Cathedral High School. When I asked where the storm had passed, my friend said it passed to the St. Cloud Hospital side of Cathedral. UPDATE II: A tornado has been spotted east of St. Cloud. Foley is expected to get hit within the next 3-5 minutes. UPDATE III: The NWS has issued a severe thunderstorm east of Foley. That cell is moving at 20 mph. 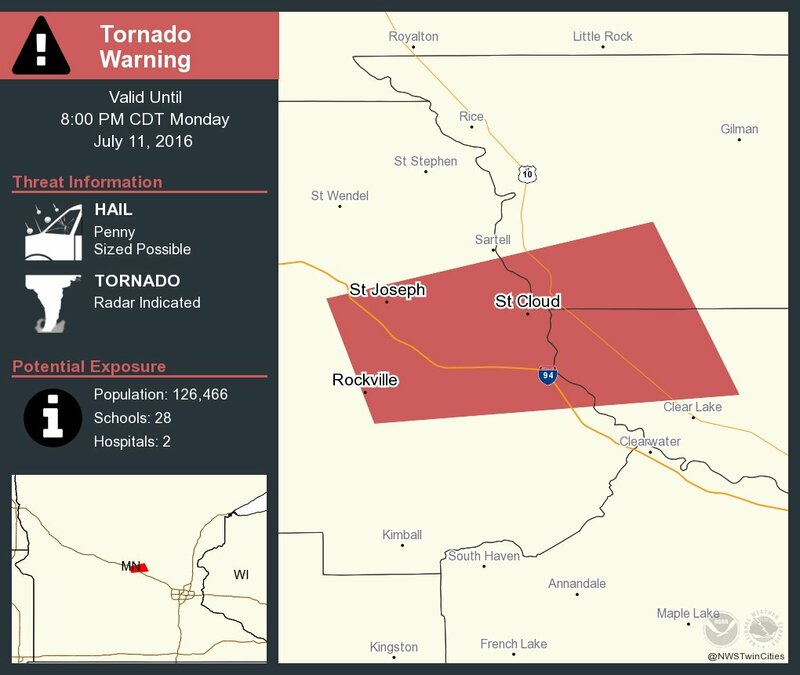 Additionally, the tornado warning for Kandiyohi County has expired but another tornado warning has been issued for central Stearns County. The tornado warning for eastern Benton County is set to expire at 7:45. Stay tuned, though. This cell has spawned at least 4 tornado touchdowns. Jeremy was born with a twisted body and a slow mind. At the age of 12, he was still in second grade, seemingly unable to learn. His teacher, Doris Miller, often became exasperated with him. He would squirm in his seat, drool and make grunting noises. Spring came and the children talked excitedly about the coming of Easter. Doris told them the story of Jesus, then to emphasize the idea of new life springing forth, she gave each of the children a large plastic egg. “Now,” she said to them “I want you to take this home & bring it back tomorrow with something inside that shows new life. Do you understand?” “Yes, Miss Miller,” the children responded enthusiastically all except Jeremy. Little Judy smiled proudly and said “Miss Miller, that one is mine.” Next Doris found a rock with moss on it. She explained that moss showed life. Billy spoke up from the back of the classroom, “My daddy helped me” he beamed. When Doris opened the fourth egg, she gasped. The egg was empty. Surely, it must be Jeremy’s, she thought. Of course, he didn’t understand her instructions. If only she hadn’t forgotten to phone his parents. Because she didn’t want to embarrass him, she quietly set the egg aside, reached for another. Suddenly Jeremy spoke up. “Miss Miller, aren’t you going to talk about my egg?” Flustered, Doris replied, “But Jeremy, your egg is empty.” He looked into her eyes and said softly, “Yes, but Jesus’ tomb was empty, too.” Time stopped. When she could speak again, Doris asked him, “Do you know why the tomb was empty?” “Oh yes,’ Jeremy said, “Jesus was killed and put in there. Then His Father raised Him up.” The recess bell rang. Three months later, Jeremy died. Those who paid their respects at the mortuary were surprised to see nineteen eggs on top of his casket, each of them empty. It’s stunning that a mentally-challenged 12-year-old understood the story of Christ’s empty tomb while it’s incomprehensible to highly educated people. I didn’t make it to the gym today. That now makes 1,500 days in a row. Dear paranoid people who check behind your shower curtains for murderers:- If you happen to find one, what’s your plan?